On 20 July 2017 early afternoon the M/V MISTRAL assumed to be in a NUC (not under command) status in the Dover Straits. She was drifting whilst she effected repairs. M/V MISTRAL was ordered to drop anchor by British Authorities to prevent the vessel from drifting into the traffic lanes. On 21 July 2017 in the morning the vessel was still anchored in the Dover Straits. She was ordered to take a tug boat towing her to a place of safety and a message was created in Thetis by British Authorities. The owner decided to continue under towage to the next port of call, the discharging port Hamburg. M/V MISTRAL arrived under towage at Hamburg on 25 July 2017. A PSC inspection for the Standard Risk Profile ship was carried out on the same day. Statutory certificates issued by Nippon Kaiji Kyokai and Turk Lloyd were presented and all were found valid until August 2019. The ISM system had been audited by Turk Lloyd and a valid DOC and SMC were available. During the ongoing inspection the vessel was detained at 15:00 PM. The inspection continued until 16:00 PM and after writing the inspection report it was handed over and explained to the captain at 17:30 PM. 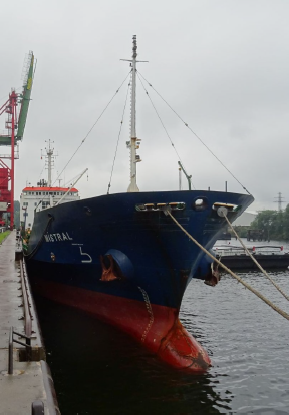 Because of the obviously sub-standard condition of the vessel – several detainable deficiencies in various areas - and the amount of detainable deficiencies in various areas the inspection was suspended and flag and RO were informed. After doing a partly repair the owner decided to tow the M/V MISTRAL as a dead vessel back to Turkey. Re-inspection took place on 28 August 2017, after the external ISM audit had been carried out. Several deficiencies were found fixed and other items were set to Code 46 – 'To be rectified at agreed repair port'. The flag state agreed to a single voyage in tow to a Turkish Ship Yard, so the vessel was released from detention on 28 August 2017. From September until November M/V MISTRAL stayed in a shipyard. She got underway again at the beginning of December 2017.